The competition between businesses exists not only in the physical world but also on the world wide web. One of their priorities? Be found on the first page of Google, Yahoo, or Bing. They actively seek the help of a Search Engine Optimisation Company to do this. Their marketing teams work closely with these third-party service providers in order to grasp the best SEO practices which they can further use in order to outrank their competition in the digital world. The first and major SEO best practice is in the little things I’d like to call “keywords”. In fact, the keywords you choose will determine how hard it is for your website to rank in search engines. If you’re paying for guys who don’t know what keywords to target, then your SEO efforts are doing more harm than good. Only the right keywords can help bring your website and content to your target audience. Instead of teaching you how to do your keyword research, I’ll introduce you to the world’s most used keyword planning tool: Google Adwords. When you know your tool, you’ll be able to use it to find the best keywords to use in your website’s content. Google Adwords, a service from the world’s most popular search engine is undeniably the quickest and easiest tool that content marketers and SEO specialists use today. SEO companies use it to look for keywords that are related to the services of their clients. It also shows the average monthly searches of every word and how strong the competition it is in ranking with those keywords. Now, search engine optimisation companies have SEO specialists in their team. These people are the master strategist who can plot your website’s keywords for you. They most likely use other keyword planning tools—some are more accurate than Google Adwords. Team up and work closely with these people. As the client, you should be aware of your SEO strategy and how these geniuses will do it. As you can see, the average word count of those who landed in the first spot on Google is 2416. That’s only three to four paragraphs more than the content which landed on the 10th spot. Now, marketers such as Neil Patel produce high-quality blog posts with more or less than 4,000 words each. His blog gets more than 100,000 visits monthly. Other content marketers and bloggers follow this trend as well. The standards get higher every year as more people and businesses engage in digital marketing. But I thought people get bored in reading long articles? When SEO first arrived in the marketing scene, it had robots who crawl over articles and push keyword-stuffed articles to the top. The result? A lot of websites with low-quality content got more traffic than those websites with useful ones. A short, spammy, and nonsense blog post can rank as long as it has the keywords that the ancient Googlebots looked for. This is the rise of short form content and a lot of Gen X and Y people have witnessed this. Some liked the idea of short and sweet articles, but most of them found it shallow too. Good thing they changed everything. The Googlebots which crawl over the content of millions of websites is smarter, making SEO more difficult. They have an algorithm that no ordinary person can explain, but SEO specialists can ride in order to improve your rankings. One way to do that is to write high-value, long form content… and do it without boring your readers! This is one of the golden rules of blogging. Using images, videos, and/or charts in your content will make it readable, even if it’s more than 2000 words long. These promote better user-experience. The key is to cut your prose right and place the image right where it is needed. In addition, multimedia content such as infographics is shared more than its prose counterparts. I am personally attracted to aesthetically appealing and informative infographics. It’s the best way to present a complicated issue or process because the creator translates the data into something engaging and bite-sized. While infographics are shareable, it doesn’t always become viral. It’s because the aim of infographics is to inform and you need more than that to become viral. According to Dr. Jonah Berger, a marketing professor at The Wharton School of the University of Pennsylvania, a highly-actionable or practical content is 34% more likely to go viral than the regular ones. If your content offers practical tips to your readers, they will most likely read it and share it with their peers whom they believe can relate to the content. As a content writer, I have rules on where my keywords should be in the article. It has to be within the first 100 words, the SEO title, the URL, the alt text of images, and in at least one subheading. Make use of the Yoast SEO in WordPress. It tells you how SEO-friendly your article is. More importantly, you have to sprinkle synonyms of your keywords throughout the article. Use it naturally in a sentence and avoid overusing it. Your readers (and Google) will not like that! In an article published in Wordstream, Larry Kim discussed how the Google algorithm, Rankbrain determines the fate of websites in the search engine. There is a direct relationship between the website’s clickthrough rate and its SEO rankings. Basically, the higher your CTRs are, the larger SEO success is waiting for you. Let me paint the picture for you. Imagine searching for your target keywords on Google. The search engine shows your website at the bottom of the first page of the results. If more people click through your link compared to your competitors, there is a possibility that you will outrank them in the future. To do that, you have to make your SEO headline and meta descriptions clear and clickable. Use numbers, power words, or parenthesis and brackets in your title to make it attractive to the readers. Larry Kim also discovered that pages with bounce rates lower than 76% rank higher. That means you have to keep your site visitors read your content and stay on your site for a longer time. As our blog posts become longer, URLs go shorter. Don’t you forget that! An article in Moz suggests that you keep your URLs shorter than 60 characters. 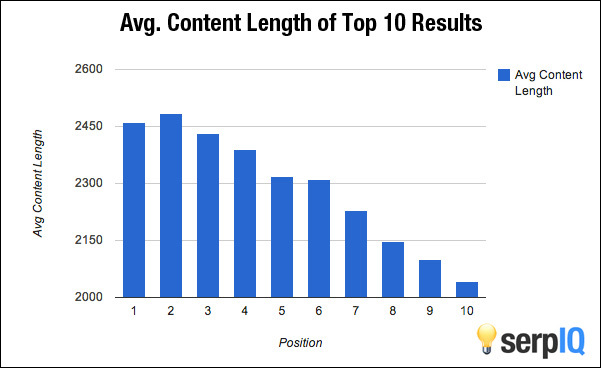 Anything longer than that will do harm to your rankings. Make sure your keyword is in there, together with other supporting words. Remove articles and stop words from your URL too. Again, use the Yoast SEO in WordPress. It tells you when your slug is too long. One thing is for sure: linking your blog to authoritative websites does good to your SEO. An authoritative website tends to have a high page authority (PA) and domain authority (DA). There are free online tools like the MozBar which helps you determine a website’s authority. I remember a time when I guest blogged on a marketing website. The editor asked me to link my articles to blogs or articles with a page authority higher than 70. Of course, these links should be related to my article. I’ve been doing the same thing and I believe you should do it too. The same thing goes with internal links. It is best if you link your new articles to an older article within your website. This enhances user-experience, promotes website navigation, and decreases the website’s bounce rates. Sounds good, right? But, we don’t recommend linking your article too much. Pick the best inbound and outbound links and strategically place them within the article. Use anchor texts properly. It’s a highlighted text on the blog so make sure it is worth highlighting. Wait with you until the magic happens! Of course, you have to show a grit personality towards your goal. If you want to rank better, set the bars high! 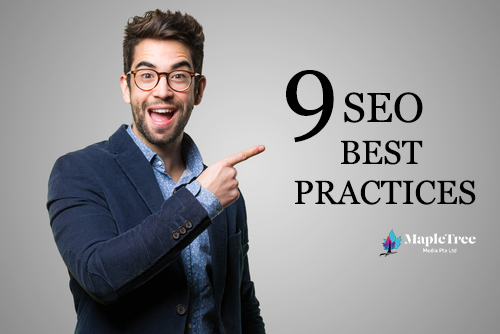 You just found the Search Engine Optimisation Company who knows how to implement the SEO best practices mentioned above. All of these tips need implementation. With Mapletree Media, you have a team of people who can strategically plan your keywords, improve your website’s user-experience, and produce high-quality content. Work with Mapletree Media and outrank your competition in the digital world! Get the latest news & digital marketing trends! Copyright © 2018 MapleTree. All rights reserved.